What is the Frostbite Falls Open, 'eh? overlooking Voyageurs National Park. We are part of the International Falls' Ice Box Days festival. ​All of our net proceeds are donated to the local food shelf, Falls Hunger Coalition. ​we're getting ready to go on our fourth go-round hosted and sponsored again by Thunderbird Lodge. 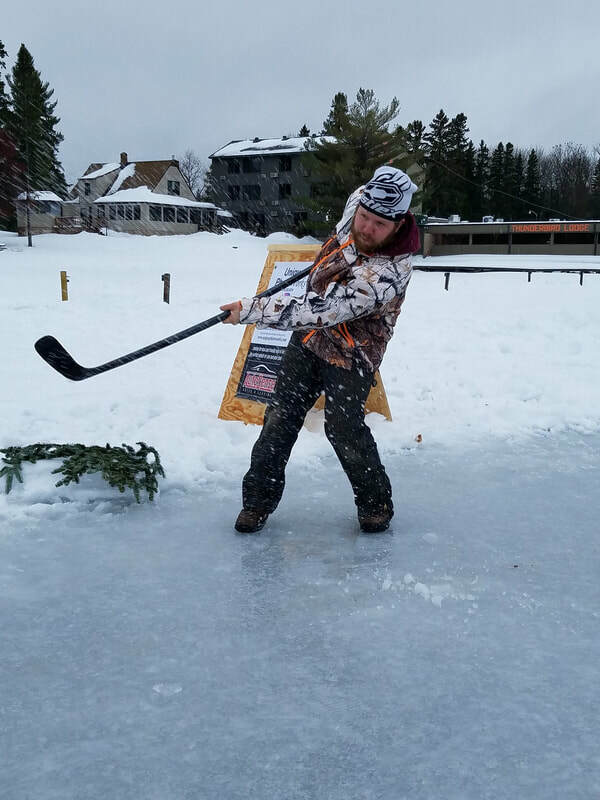 Entrants compete on a nine hole ice golf course. We supply the tennis balls, you bring the golf club of your choice: Tennis racket, golf club, hockey stick, tee-ball bat. . . Anything you can use to hit the ball off of the ground. Register for four-person teams and the rules of the day will be a Best Ball format. (Hurry, limited to only 18 teams!) Prizes will be given to the team with the best score, team with the best sled (think golf hand cart with a costume of its own), and the winner of the longest-drive competition. Come early with the family or use the Putting Green all day starting at 11:00 am. Each ball is $5 with proceeds benefiting the Falls Hunger Coalition. The Longest Drive Competition starts immediately following the tourney with a first place prize for the longest drive! Each player gets two shots for $5 with proceeds benefiting the Falls Hunger Coalition. This event begins immediately after the main tournament at approximately 3 pm. 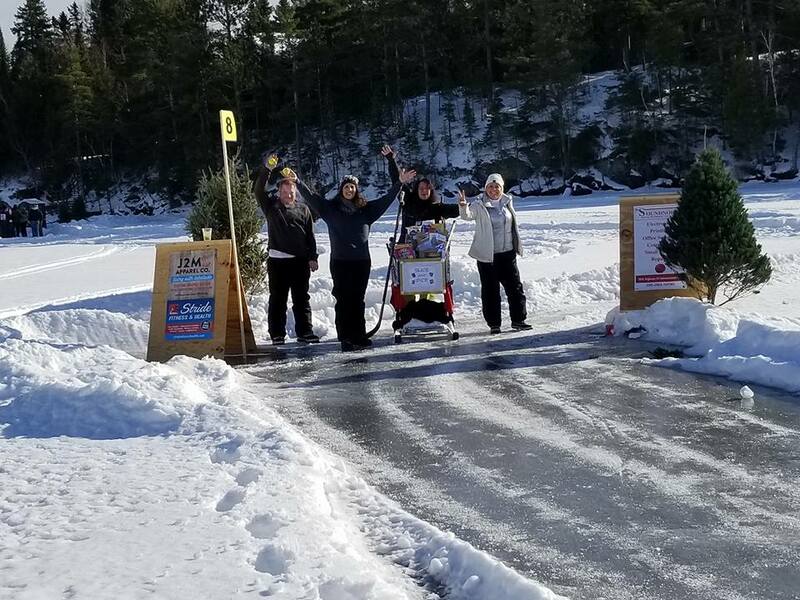 The Ice Golf Course will be open for open play on Sunday January 20, 2019 from 11 am to 4 pm. Bring your family and friends! Stop by the lounge at the Thunderbird Lodge to grab your balls and make a free will donation to the Falls Hunger Coalition. How do I participate, volunteer or sponsor this event? GOLFERS: Click here to register yourself and up to 3 other players as a team. If you don't have a team, you can just register as an individual player and be assigned to a team on event day. If you find others you want to be a team with after registering, no problem, just let us know via our Facebook page. SPONSORS: Click here to see what advertising opportunities we offer in the time leading up to and during the event as a Sponsor of the Frostbite Falls Open. VOLUNTEERS: We will not turn away help! If you are interested in volunteering, click here to register yourself as a Volunteer. Someone from the planning committee will contact you to see how you can help make this a fun and successful event.